Product Description: L-Carnitine is a non-essential amino acid that helps to maintain overall good health by facilitating the transfer of fatty acid groups into the mitochondrial membrane for cellular energy production. * It naturally occurs in red meat and other animal source foods, but we recommend supplementation to obtain optimal levels of this excellent amino acid. 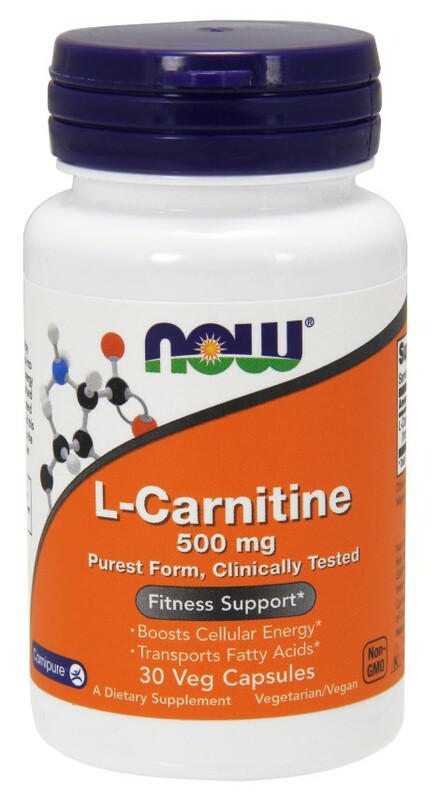 NOW L-Carnitine is the purest form, clinically tested, and vegetarian (non-animal sourced). Purest Form, Clinically Tested Transports Fatty Acids Boosts Cellular Energy* A Dietary Supplement Vegetarian Formula. Suggested Usage: As a dietary supplement, take 1 Vcap 1 to 3 times daily with or without food. Ingredients: Cellulose (capsule), Cellulose, Magnesium Stearate (vegetable source) and Silica. Contains no: sugar, salt, starch, yeast, wheat, gluten, corn, soy, milk, egg, shellfish or preservatives. Vegetarian/Vegan Product. Do Not Eat Freshness Packet. Keep in Bottle. Carnipure offers purest L-Carnitine and is a trademark of Lonza, Ltd., Switzerland. Vcaps is a registered trademark of Capsugel. Store in a cool, dry place. Please Recycle.